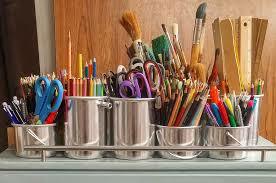 In case you wish to learn drawing, you must know what materials that will enable you to succeed in the drawing. As a beginner artist, you must get the right recommendations on best materials and tools. So, if you are a beginner in this skill, read on to know what materials are the best for new artists to learn with. Do not start drawing with pens. Pencils are easy to control and quite easy to use, you might have seen many artists who use the pen for finishing the drawing as a drawing finished with pen looks nice and prominent. But as a beginner, one should never think of using a pen instead of pencils. Pencil lines are easy to erase, so if you make a mistake, you can always go back and make corrections which would not be that easy if you use the pen. Also, good drawing quality pens are not cheap, so keeping everything in mind opt for pencils. Do not draw on a huge sized paper. When starting out don’t use a huge sized paper that is not easy to handle. Best is to use a notebook. Only thing checks that the quality of the paper is good so that when you rub out something with your eraser, it does not look dirty. Another thing that is very important to keep in mind while creating your initial sketches –always use an HB or H2 grade pencil, and use very little pressure so that the lines are faint enough. That way when required you can easily erase them without making the work look unclean. You should make an eraser that erases cleanly. But it’s not about pencils and paper alone your eraser also plays an important role here, unless you have a good quality eraser there is a chance you will have difficulty in producing a clean drawing. You may already have some erasers at your disposal check them as to whether those are of good quality, if not get a new one from the nearest art supply store. Have a piece of cloth handy.A piece of white cloth can be a very useful implement. Use it to clean your hands before you touch the drawing paper. You can as well use it to clean your notebook after you erase some part of your drawing. And if you have the habit of resting your palm on the notebook itself lay the cloth on the paper and rest your palm on it. If required take help of tracing paper in the initial days. Have a bunch of tracing papers; this can be very helpful for the budding cartoonists when they’re approaching comparatively complex drawings. Trace the outline and important parts of the figure that you intend to draw on the tracing paper. And then place the tracing paper on your notebook and pencil through the tracing lines. By doing that you will have pressure lines now your notebook itself, use that as a guideline and fill in the details. Voila! You have just produced a great drawing. Grid papers can be your friend.Like tracing papers, you can make use of grid lined papers. When drawing on a grid lined papers, you get a clear idea of size and proportions of what you are trying to draw because you analyze that way taking the grid lines as reference. And this technique can train you quickly on how to analyze the subject regarding shape, size, and proportions. Now let’s talk about the most important thing then you should have in your store that is the passion for drawing if you have enough passion you can make drawings without fancy tools. But if it is otherwise any number of high-end drawing tools may not be sufficient. So check that before jumping into this. Thanks to http://www.raleighplumber.org for getting our blog up and running, we appreciate you! While we are working on new content, please enjoy this cool video!